AccuScore’s computer feels rather strongly that the Golden State Warriors will win the 2017 NBA Finals and win rather comfortably. The Warriors won 88.5% of the 10,000 series played out in the simulated environment, while Cleveland only won 11.5% of the time. It’s not impossible for LeBron James and company to win, but they face long odds. If it’s going to happen, Game 6 gives the Cavs their best chance to win. According to the computer, Warriors in 5 is the most likely outcome with 34.3% of simulations ending with the Warriors standing victorious after 5 games. However, there is a 21.3% chance that this series goes the full 7 games. The Golden State Warriors and Cleveland Cavaliers tip off their NBA Finals rematch Thursday at Oracle Arena. Anyone following the league this year knew this rematch was practically inevitable - two stacked teams that were clearly head and shoulders above the competition. The Warriors are 7-point favorites with the total set at 225. A day ahead of the game, wager tracking data suggested that the majority of the public is leaning towards a Cleveland moneyline pick, with close to 74% of ML dollars on the Cavs (+270) for Game 1. AccuScore sim data, however, would go against the public trend in this case. The Warriors cover a -7 spread in over 82 percent of simulations, suggesting some value on an ATS pick that generally suggests 52-to-53 percent chance of happening (-110). The biggest value in Game 1 seems to be on the total though, with AccuScore's simulated total about five points lower than that listed in Vegas. • The Cavs are 2-5 straight up (SU) in their last seven road games vs the Warriors. • The Cavaliers are 1-6 SU and 2-5 ATS in their last seven games as an underdog of 7.0 points or less. Limited Time NBA Finals Special Get access to expert picks, top trends and the best betting analysis for the NBA Finals, NHL Stanley Cup Finals, Major League Baseball and every other sport AccuScore covers when you Join Now using the coupon code NBAFINALS and get 30% off membership (monthly or annual). This is our best offer of the summer and is only available for a limited time: Become a Member Today! Steph Curry has quietly had an incredible postseason. Even beyond the remarkable 12-0 start to the playoffs, Curry's numbers have been under-hyped. Currently, he's averaging 28.6 points per game on 43 percent shooting from beyond the arc and 50 percent overall from the field. Outside of someone like LeBron James, there's no one playing better ball than Curry. In the decisive fourth quarter of last year's Game 7 vs the Cavaliers in the NBA Finals, Curry was just 1-of-6 from the field. Let's just say he'll look to replace that memory with a better one this time around. The Cavaliers' offense has been beyond comprehension in the postseason, putting up 120.7 points per 100 possessions. We're expecting them to be just fine on that end of the floor. What potentially could be a nightmare is their struggling defense. 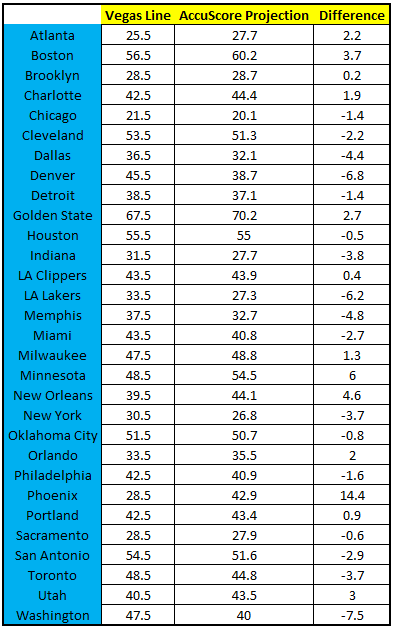 In the regular season, only eight teams had a worse defensive rating compared to Cleveland. The Los Angeles Lakers are slight 56 percent favorites over the Chicago Bulls. 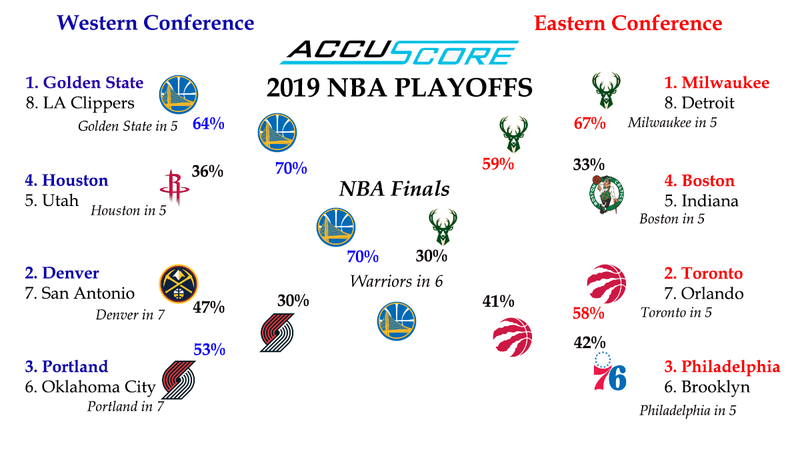 Based on Accuscore’s simulations, the Bulls are projected to shoot 43.9 percent from the field, while the Lakers are forecasted to shoot 45.5 percent. Tonight, the Lakers have the rebounding advantage at 48.8 to 46.1. One reason for the slight advantage for the Lakers is that they are committing fewer turnovers at 12.3 vs 15.6 for the Bulls. However, the Bulls make 11 three pointers on 34.8 percent from distance compared to the Lakers hitting 7 three pointers on 30.6 percent. Not a member? Try AccuScore Free for 7-days: first time members get a free 7-day trial of AccuScore’s full site when you register for a monthly membership. Join AccuScore Today! This could be a head-to-head matchup between top rookies from both teams Lauri Markkanen from Chicago and Lonzo Ball from the Lakers. Simulations predict that it is center Brook Lopez that would tally highest points amount for the Lakers. Ball should get the highest amount of assists in the game. Betting lines show the Lakers as clear favorites for this game. Their moneyline for the win is -195 that is around 65% probability to win this ballgame. 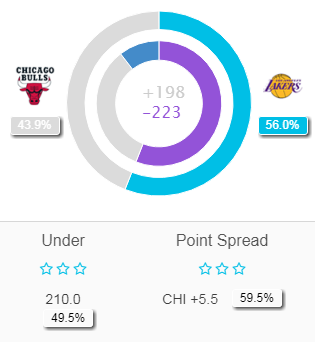 Since AccuScore has the Lakers winning at a 56-percent clip, the side value is picking Chicago. If you have been betting on every side value in NBA games during this season according to Accuscore simulations, you would have 543 dollars profit in your pocket. The Total line for the game in simulation is 207, but Vegas lines give higher numbers (210.5). Since start of the season Accuscore’s total predictions have generated 1820 dollars profit with bet of 100 dollar per game. Thus far, AccuScore has been correct on the Lakers' total line in 11 of the 17 games. For Tuesday, the computer likes the Under. The 2017-18 NBA season is here, and AccuScore simulated out every game 10,000 times to project out win totals for every team, and as we're accustomed to doing, we placed those win totals next to Las Vegas' win totals lines so that you can see the best value bets according to the AccuScore computer. Notably, the computer believes the Golden State Warriors will win 70 games, meaning the Warriors will become the first team to cross the 70-win mark multiple times, and the computer projects the Warriors to hit those all-time heights twice in a three year span. Also, the computer is down on the Los Angeles Lakers, Chicago Bulls, Brooklyn Nets and New York Knicks, with the three biggest markets in the NBA projected to feature four teams that all fail to hit 30 wins on the season. Chicago is projected to finish with an NBA-worst 20 wins, while the Lakers and Knicks rebuilding jobs have two of the NBA's marquee franchises handing in the 26-28 win range. Boston is projected to win 60 games and lead the Eastern Conference in wins for the second straight year, and Cleveland is projected to finish second. As a note, these projections came before Gordon Hayward's horrific injury, but Boston finishing above Cleveland in the regular season was the computer's preseason pick, so we'll stick with it. Out West, the Warriors are the best team in the league, but San Antonio has competition with Houston, Minnesota and Oklahoma City all projected to win over 50 games and stack up the Western Conference Playoffs. Membership Special: Use coupon code NBAOpen for 30% off All-Access All-Sports Annual membership for a limited time... Join AccuScore Now! The Golden State Warriors are one win away from a historic 16-0 postseason as they head into Game 4 of the NBA Finals Friday night. The fans were finally treated to a close, competitive contest in Game 3, but the Warriors pulled out a 118-113 victory as the Cavaliers failed to score a basket in the final few minutes of action. The Warriors winning this series is practically a done deal, and the majority of the media, and betting public feel Game 4 will be the final game of the NBA season. NBA FINALS SPECIAL - Extended: Use coupon code NBA20 and get 20% off membership instantly. With an annual membership, you'll get all our NBA picks for the entire 2017 NBA regular season and playoffs! This is truly the best time to join. PLUS: You'll get AccuScore's award winning NFL Picks, along with the entire NCAA football and NCAA basketball seasons. Everything is included: Join now at 20% off our annual fee: Become a Member Today! The Warriors are favored by 6 points, with the total set at 229. Where's the value in this game? AccuScore sim data has a bit more faith in the Cavs extending the series and escaping the embarrassment of being swept than do Vegas odds makers. Cleveland's getting +140 on the money line, indicating about a 41-to-42 percent chance of winning. Sim data, however, has that percentage up to about 46 percent, suggesting some value on a money line or spread pick on Cleveland. There's plenty of prop bets for Game 4, and one that caught our eye is the total points scored by Cavaliers forward Kevin Love. The over/under for Friday's game is set at 16.5 points. Through three games in the Finals, Love is averaging 17 points per game. In Game 1, he scored 15; 27 in Game 2, and 9 in Game 3. Given the way he's trending, the pick is the UNDER on this prop bet. After 10,000-plus simulations, Love is projected to finish Game 4 with 16 points on 5-of-11 shooting from the field. Last Chance:: Use coupon code NBA20 and get 20% off membership instantly. Join Today! On Tuesday night, the Philadelphia 76ers travel to face the Charlotte Hornets in AccuScore's daily free NBA forecast of the day. AccuScore analyzed the odds and actually found that Vegas has this game right, so there is not side value on either team based on the current odds. The Philadelphia 76ers are 55.1% favorites according to AccuScore and 55.2% favorites according to Vegas. Similarly, Charlotte +2.0 may be slightly more likely to occur than Philadelphia -2.0, but the margins are slim and neither outcome occurred in 50% of simulations. This is a close game and the Sixers are favorites on the moneyline, but there's much value to speak about on the moneyline or against the spread. So, that leaves the totals. Here, the computer does find value. With a Total points line of 214.0, 56% of AccuScore's 10,000 simulations went UNDER. The average score was Philly 106.5, Charlotte 103.4. From a player point of view, Joel Embiid and Kemba Walker project to be the leading scorers in the game, with both players averaging slightly above 18 points per simulation...AccuScore has full player projections in the free forecast preview. On Friday night in Orlando, the Detroit Pistons are the slightest of favorites at 50.1% to win, according to AccuScore's simulations. 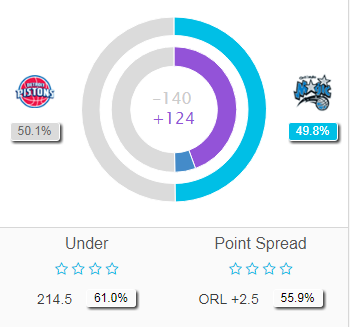 While that still makes the Pistons the moneyline favorites, the odds makers have the Pistons at 58.2% to win, so there's side value on picking the Orlando Magic to pull the upset in this game. AccuScore is +1211 on side value picks when the Pistons are on the road this season, so the trends suggest you take notice. While picking the Magic on the moneyline may be a bit adventurous, the close nature of this game suggests that Orlando +2.5 may be the better play, and it is a 4-star trends pick from AccuScore, with 55.9% of simulations resulting in the Magic either winning outright or losing by 2 or fewer points. On the Totals pick, AccuScore again has a 4-star pick for Friday's game with 61% of simulations going UNDER the 214.5 combined points. Our forecast also allows you to adjust the line if you're getting different odds. -Detroit Pistons: AccuScore is 21-7, 75% +1330 on picking Totals in away games for the Pistons this season. -Orlando Magic: AccuScore is 18-11, 62% +590 on picking Totals in home games for the Magic this season. -Orlando Magic: AccuScore is 16-13, 55% +417 on side value picks on all Magic home games this season. Blake Griffin projects to lead Detroit in scoring, averaging 18.4 points and 7.2 rebounds per simulation. Andre Drummond is next on the Pistons with 13.4 points and 13.4 rebounds in the game. Even Fournier leads the Magic with 15.6 points per simulation, but five different Orlando players averaged double figures in scoring in simulations. AccuScore played out Wednesday's contest 10,000 times to derive statistical data and make predictions, as it does for every NBA game throughout the season. The Detroit Pistons are heavy 76.2 percent favorites over the Phoenix Suns on Wednesday night. One reason for this is that the Suns are shooting 44.6 percent from the field, while the Pistons are forecasted to shoot 47.4 percent. The rebounding battle is pretty even with Phoenix projected for 45.9 rebounds vs. 47.4 for Detroit. At the same time in predictions the Pistons are committing fewer turnovers at 12.7 compared to 15 for Phoenix. The Pistons also have a slight edge when we check shooting from distance. The Suns are making 7.5 three pointers on 33 percent, but the Pistons make 10.1 three pointers on 39.3 percent. That's a notable difference. Sportsbooks and handicappers have set the line at DET -12 with TOTAL 217. Accuscore predictions show that there is 62.2% chance for Phoenix to cover 12 points handicap. Actually, the line should be -8 based on AccuScore's simulation analysis. In terms of Totals, the UNDER is the occurred in 57% of simulations. 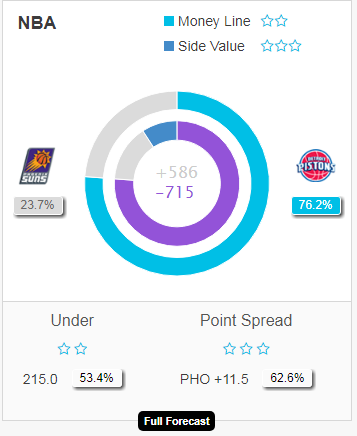 The side value for this game is on Phoenix, so that should be the moneyline bet, even though they are predicted to be underdogs with only a 24% win probability. Detroit Pistons games when betting UNDER have been a solid trend, as 13 has been correct compared to 6 wrong since start of the season. That's a return of +583. The NFL season is approaching the climax with the playoff race heated to boiling temperatures and the best teams aiming to get first round byes. Accuscore’s predictions have been steady since start of the season. Even though against the spread (ATS) is just about breaking even, TOTALS bets have brought a profit of 1350 units with 100 units wagered on every game. In addition, AFC North games have been a hot trend moneybank of the season. These AFC North games have yielded +2170 profit for all of AccuScore's ATS and TOTALS picks. Another trend that is good to highlight is the ATS results in the games where Accuscore predicted line is within 2.5 points to Vegas line. Games fitting this criteria have resulted in profit of +2210 since start of the season. The NBA season has been on the way without any great upsets or disappointments. Maybe Oklahoma City hasn’t played as well as predicted, but the season is long and OKC still has time to right the ship given its new additions. With about a third of the season gone, the NBA's profitability factor can now begin to be evaluated. When betting each and every game in TOTALS, Money Line, Point Spread and Side Value markets, bettors have resulted over 1000 profit since start of the season with 100 bet. This may not be a massive return, but current season data takes time to integrate, and being positive at this stage is a great sign. So far, the best performing market has been NBA totals when Accuscore has predicted UNDER over 50% of the time. Vegas linemakers have seemingly adjusted their lines too much based on the NBA game changing into a 3-point shooting contest. 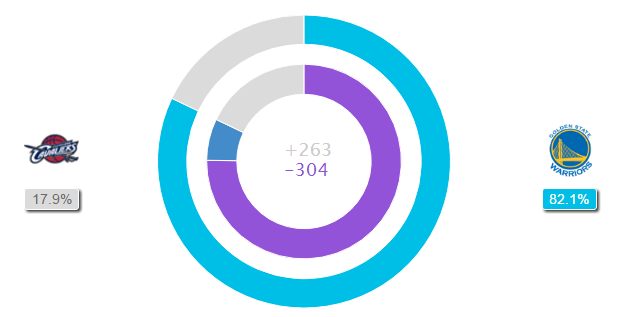 Accuscore's TOTALS bets are +3040 on green since start of the season. During last 4 days also, Side Value bets have resulted over 400 profit. We hope that this trend continues through the Holiday season and into 2018. The bowl season has started in college football. Accuscore has picks for all bowl games and we launched a detailed video predictions series for the most interesting games. So far our picks are 100%! Next week, we will review the results from the early Bowl games, as well as show off AccuScore's highly profitable soccer record that bringing great returns year after year for our members...not a member? Join Today!